"I'm kinda proud of the result": absoultley properly. Great pic. It's not the next 'obvious' pic of Le Moulin Rouge. Beautiful picture! The best photographic rendition of the ”Moulin Rouge” I have ever seen. The bottom half looks so impressionistic. It contrasts so well with the top half. Very nice photo - love the reflection in the forefront. It looks like a post card. 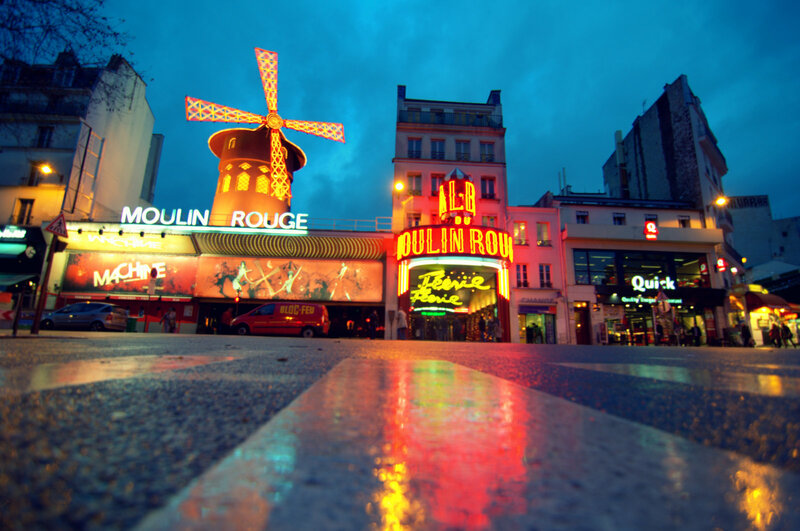 No trafic & nobody around Le Moulin Rouge? That's amazing.I like the song too. Good job, Eric. That IS a great pic! It'd be a good one to include in your calendar of Paris. nice picture Eric, beautiful reflection of the colors. just wondering... was your perspective laying on the ground? Le Tenin perspective: c'est parfait. And can anybody tell my why I should not fantasize about Nicole? Just got home from meeting with mon ami Craig. Drank wine and talked about Paris. Not a bad night. I always love your perspective shots. It's a great shot, Eric! Do you think the two may be connected? Eric, can you take a good photo? Funny you should say that Eric, a while ago a drunk bloke in a pub asked me if I was Larry David. I replied, "Buy me a drink and I'll tell you." Sadly, he wasn't THAT drunk. On my first trip to Paris I stayed on Rue Lepic - right around the corner from this photo. What great memories is brings back! Fine capture from your always interesting perspective. @Magdalena "It's not the next 'obvious' pic of Le Moulin Rouge." Thanks that is exactly what I was trying to avoid! @P "No trafic & nobody around Le Moulin Rouge? That's amazing." Probably because it's a very quiet week in Paris. @Jeff" Le Tenin perspective: c'est parfait. And can anybody tell my why I should not fantasize about Nicole?" No reason not too! I just saw she's about to be Grace Kelly in a movie to be released. She looks stunning in the photos I saw. To late to say hi to Craig. Drummond: I don't need wine to fantasize about Nicole, and I don't need to fantasize about anyone to drink wine. Therefore: no correlation, just coincidence! Downright pretty! That blue hour light sets off the warm lights so well. Love the slick pavement. Thanks for the song, too.